9800 feet on a cool day with the smell of sage pungent in the air. 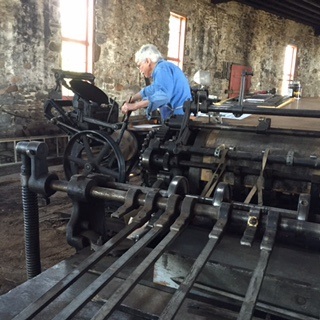 This past weekend, board members Tom Parson, Marc Silberman and Patti Parson were at Como Roundhouse, the last remaining stone narrow gauge roundhouse in Colorado, to print on a 12x15 C&P Gordon Old Style press and talk Depot talk. We bonded over printing and railroads and vintage equipment with hundreds of people from the mountain communities, from Denver, from Wisconsin and Minnesota. And then there were two young women who had biked from Banff, and stopped on their way to the Mexico border! Besides the C&P, there was a non-working Miehle Pony press used to print the Fairplay Flume. One last page still set up on a chase - an announcement about burro races, with the band Zephy and appearances by Allen Ginsberg and Peter Orlovsky. What a frozen moment in time! Oh and the thing that was missing? A way to power the C&P. No motor…that was ok. But no treadle either. All depended on an inexhaustible left arm on the flywheel, which Tom supplied.